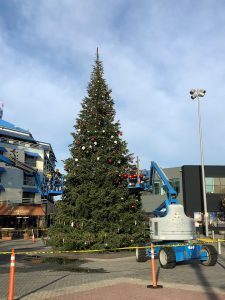 Oakland, CA – November 28, 2018: Jack London Square lights up for the holidays with the annual Tree Lighting Ceremony on Friday, November 30, from 5 P.M. to 8 P.M. The annual event includes the lighting of the 55-foot Mount Shasta fir tree decorated with 5,000 lights and 600 ornaments. Guests will experience music and entertainment from local musicians, arts groups, holiday pop-up shops and a chance for a free photo with Santa. The festivities are public and free to attend, with holiday treats and beverages available for purchase. The event includes a donation drive to collect non-perishable foods, unwrapped toys and gently-worn coats for nonprofit organizations, including the Oakland Fire Department’s One Warm Coat drive. Kev Choice and Friends, local youth performers, and others are providing the entertainment at this family-friendly holiday celebration. Handmade items will be available for purchase from local makers and artisans at holiday pop-ups throughout the Square. Attendees can arrive early to try specials at Jack London Square’s array of restaurants including Belcampo Oakland, Dyafa, Farmhouse Kitchen Thai Cuisine, Forge Pizza, Lungomare, Kincaid’s, Plank, Rosenblum Cellars and Scott’s. Transportation options to the Square include the Alameda/SF Bay Ferry, Amtrak, biking, walking and driving. The free “B” Broadway shuttle runs Monday thru Friday, from 7 A.M. to 10 P.M. The shuttle will take you anywhere from Uptown Oakland to Jack London Square and back. For directions to the Oakland waterfront, please go here.